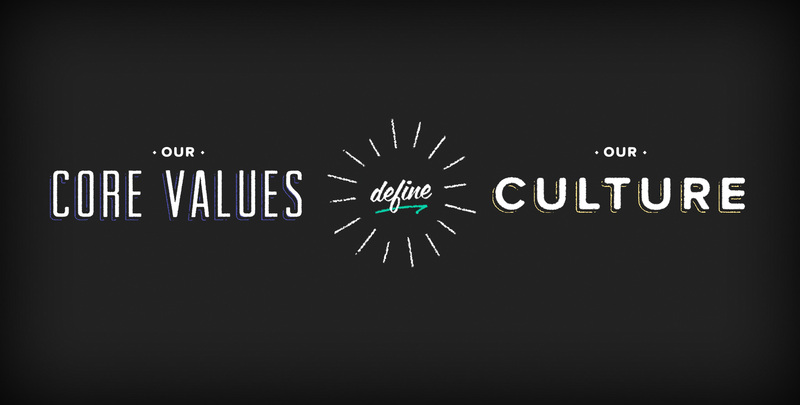 Values are something people often talk about but rarely think about. 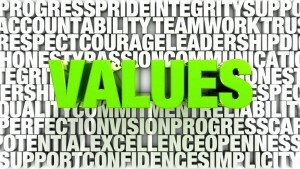 Leaders talk about positive values but often do not stop to think of where the values their team will follow come from. 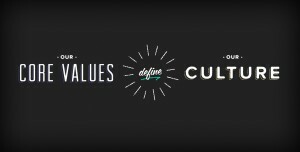 Often when leaders say, “positive values”, they actually mean—their personal values. While their personal values may be positive in their mind, they are often not the most effective values to guide a team or organization. Research shows our values come from our beliefs, the way we as an individual see the world. Research also shows that we are all a product of where we were born, when we were born, and the culture we grew up in. The result is that we all see the world differently. Different life experiences make different world views and therefore, different values. When people come together in the work environment you have as many different sets of values as you have people involved. 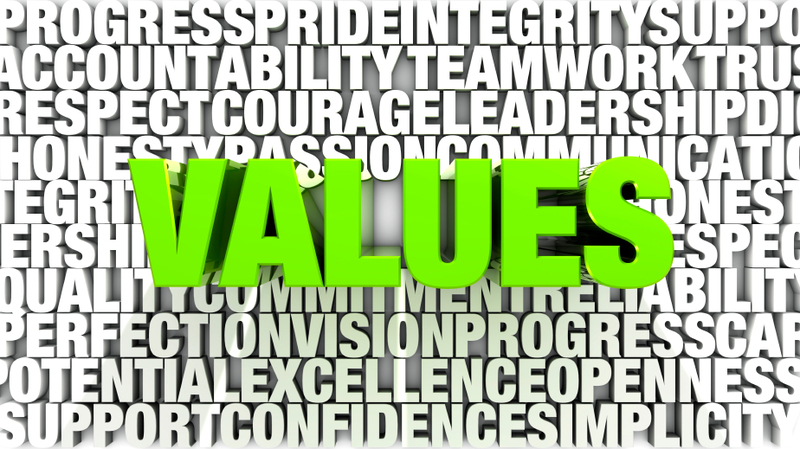 The question is then, “which set of values are the right values for the team to follow?” If your answer to this question is “the leaders”, then you would be wrong. Why? Because choosing and using one individual’s values creates conflict in the work environment. By asking team members to follow the leader’s values, in essence, we are asking the team members to believe what the leader believes. People do not change their beliefs so easily and not just because someone tells them they should. The most successful leaders who lead the most successful teams understand that values are the foundation their success is built on. To be effective, the values must define, promote, and require the behaviors and characteristics that will facilitate the team’s journey in its pursuit of the organization’s mission or goals. Look at the required values as a neutral set of values that are chosen strategically by the leader and based on the positive pursuit of the organization’s mission, so that everyone on the team can clearly understand how the chosen values lead to the desired goals and not to any one person’s personal agenda or beliefs. It must be clear that the work environment is based on the needs of the team and designed for its success and not to fulfill any one person’s personal ideas of the way the world should be. There are successful businesses based on personal beliefs, Chick Fil-A is a good example. Chick Fil-A is built on religious values and it has worked well for them. The drawback is that in an organization like that, only people who share those values are good candidates for employment. The larger the organization gets, the harder it will be to limit turnover and conflict, as the number of people who share those core beliefs and desire to work with the organization dwindles. There are also many very talented people who could greatly help the organization who would not be comfortable in an environment based on one core set of beliefs. For organizations that respect diversity and want to harness the power of people with a variety of life experiences and cultures, a more strategic and neutral set of values is required. By adopting positive goal focused values, an organization has an enormous employee pool—in essence, the world. Trying to stay in line with an individual’s or single group’s values the employment pool will be exponentially smaller. Successful teams are built on values that provide opportunities for PEOPLE to learn, grow, and succeed through positively focused, people-centric, goal oriented effort and action. The bottom line is that using positive people-centric values where everyone is treated with dignity, respect, and honesty at all times appeals and works well with virtually everyone – not just a certain group. Don’t limit your effectiveness or resource opportunities; choose the values that make people want to work with your organization. If you think about it, if everyone is treated with dignity, respect, and honestly all the time, what group wouldn’t appreciate and benefit from it. This is the foundation of positive and effective leadership. All Team-builder Leadership Institute training builds a standard of high performance and positive values focused on goal attainment.